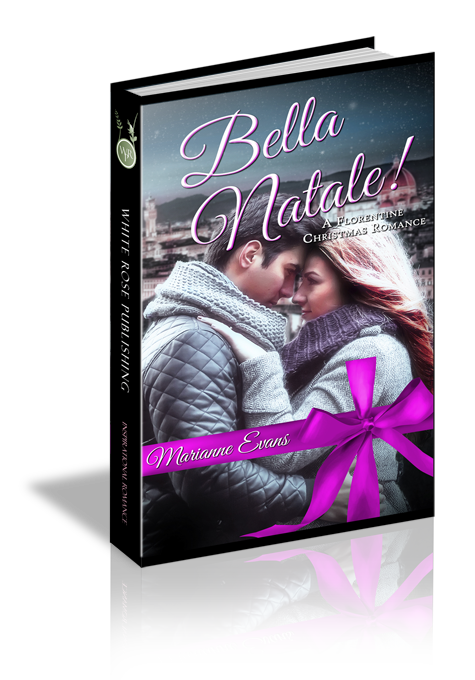 Home BROWSE eBOOKS BY... Christmas Extravaganza Bella Natale! Ashley Coratini is bucking her family, and the odds, by embracing the chance to pursue a dream. During a three-week trip to Florence, Italy, she’s determined to immerse herself in the world of art and to explore the gifts God has given her. Widower Luca DeRosa owns and operates a premiere art gallery at the heart of Florence. He’s just over a year away from turning forty, but doesn’t mind the milestone. He enjoys a life spent raising his five-year-old son and scouting artistic talent. When he comes upon Ashley, he’s captivated by her artistic skills and fluid grace, and he sees to it that Ashley’s dreams take off at high velocity. But as love blooms, questions mount. Will Ashley embrace her gifts and a life in Italy that’s worlds different than the one waiting at home in America? Can Luca trust his heart and instincts enough to embrace the love of a vibrant young woman whose spirit speaks to him so deeply? What comes next when the dreams they dare to dream really might come true…? Ashley Coratini sat on a ledge at the center of the Ponte Vecchio that jutted outward from the base of the structure and left just enough room to position her back comfortably against cold, time-worn stone and dangle her legs. Somewhat of a daredevil perch, to be sure, leaving herself suspended some one hundred feet or so above the churning surface of the Arno River; but the view was unusual, and stunning. Sketchpad open across her lap, charcoal pencil in hand, she tucked a rippling curl of hair beneath the edge of her knit cap, focus trained on a greenish-brown mountain scape that framed the horizon just beyond the curves of the river. Beneath her feet, water rushed and tossed. Returning to her sketch, Ashley lost herself in the euphoria that always accompanied a particularly eloquent art session. Paved by narrow roads of ancient brick and stone, hemmed in by shops, homes, natives and tourists, this city of Medici—Florence, Italy—was the perfect place to re-find herself. God knew she needed to figure out the road ahead…and soon. Nonna Rosa’s promptings had been right, of course; more to the point, her grandma’s generosity allowed Ashley to free-fall into a much needed season of self-exploration. She had studied here for six weeks during her junior year of college, during a study abroad session wherein she had immersed herself thoroughly in art and Italian history. Returning to Firenze in many ways felt like returning home. A stiff wind kicked across her skin, leaving a chill. The December air almost tasted of snow. When the corners of her pad lifted, Ashley smoothed the edges and continued to sketch—a spray of lines, a dash of shapes and shadows, a subtle blend of charcoal into the page, just enough contrast to create the illusion of light. She sank into the evolving image, lost to the world, thinking. She hadn’t meant to let outside influences dictate the pattern of her life. She hadn’t meant to let any form of naysaying—however well-meaning—keep her from the life she craved. So, she had accepted her grandmother’s gift of three weeks in Italy, opting to take that leap and rediscover Florence with a full and eager heart, eyes trained only on the future. Early afternoon light shimmered off the surface of the water; Vespa cycles sped past at horrific speeds and angles, their shrill engines cutting the air, adding texture to the sound of lilting Italian. Seemingly undeterred by an ominous forecast, crowds milled past on the walkway just above and behind Ashley’s spot. A second blast of cold air roused her senses, eliciting a responsive chill. It was almost time to call it quits and perhaps spend an hour or two like any other tourist in Florence, exploring quaint, inviting shops and indulging in a hot meal, but in the distance, she spied the magnificent Duomo. Shifting from black- to gray-tinted charcoal, she went to work capturing its shape, the shading of its cupola, the lines and angles of its façade, before surrendering her artistic efforts for the time being. The first thing Luca DeRosa noticed about the stranger was her hands. Perched just below him, on a ledge of the Ponte Vecchio, a waifish, brunette stroked swift, confident lines across the surface of a wire-bound sketch pad centered across her lap. Fluid grace punctuated the way she crafted a scene of the Arno, bringing her vision to life with a level of detail and eloquence that pulled him to stay put and absorb. Engrossed, she paused infrequently, just long enough to give brief study the world around her—the inward roll of fat, moisture-laden clouds, the dancing spikes of sunlight that intermittently pierced the cover of gray—before returning to her drawing. The creationist that had always resided in Luca’s soul admired the woman’s skill. Ever a tactile person, he continued to watch the way she used the tips of long, slender fingers to blend and shade. Her gentle strokes evoked a responsive warmth that built at his chest and flowed through his gut—launching the kind of intrigue and hunger only a fellow artist would truly understand, for the hunger he felt wasn’t merely physical, it seeped through the farthest reaches of his senses in a call that left behind an empty ache. A longing. That fact alone should have prompted him to a hard pull-back from a reckless topple into attraction. Hadn’t his heart just been extracted with nothing more than a blunt spoon? Hadn’t he just traded one hope, one dream, for another? Luc blinked, regrouped, and took a deep breath of cold air spiced by the promise of a December snow to come. Forecasters projected a blanket of white would soon cover the cobbled streets, slated rooftops and dormant balconies of Florence. He refocused when the artist stood, carefully, since her perch was somewhat narrow and precarious. She lifted onto the wide cement rail that served as a lookout post along this particular stretch of Florence’s most historic and storied bridge. When she swung her legs over, Luc ignored an instinct to withdraw and instead stepped forward. “Please, allow me.” He spoke his native Italian—and received a blank, somewhat sheepish look in return. “I do.” Luc switched languages and took custody of her wire-bound pad. He helped her land safely by lifting her via a secure, two-handed hold against her waist. Light as a feather, he thought, once again sensing a natural grace. She extended her hand in reciprocation then froze. He puzzled at the flash of surprise that glanced across her features. Luc accepted her hand; he held fast and nodded while she continued to study him. “You’re startled. May I ask why?” During the ensuing pause, Luc slid into a vision of her being put off by his overt physical gestures. He released his hold and cringed at the idea, yet the connection had occurred instinctively, with unexpected ease. She ducked her head in retreat and claimed her drawings. A polite finality marked her words, accompanied by a second brief smile. She turned away and something mysterious pulsed beneath his skin. She turned back, as decorum dictated, but tense body language and a subtle frown line between her brows threw an air of caution against his offer. She was suspicious, and he couldn’t blame her. After all, he was nothing more than a stranger. Tightening her hold on the strap of her purse, she waited on him, eyes narrowed and questioning. She kept a liberal degree of distance between them, so Luc decided a more appropriate ice breaker was called for. From the pocket of his slacks, he slid free a business card and handed it to her. His invitation hadn’t been well thought out—way too impulsive—he had to get going for both business and personal reasons, but that didn’t change his level of interest, in both the artwork he witnessed and the woman behind it.